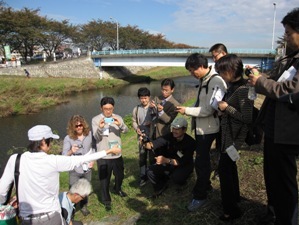 Foreign lecturers attended the ARRN International Forum 2011, and relevant personnel of ARRN visited the Kurome River in Asaka City, Saitama Prefecture. 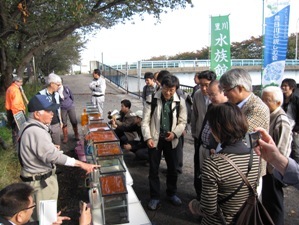 They participated in an exchange event held by the Asaka Land Development Office in Saitama Prefecture which is responsible for river management, and the “Kurome River Working Group” which promotes river environment improvement in the Kurome River. Through this event, participants were able to observe actual river development balancing flood control and environmental preservation, and to learn about specific efforts for collaboration between citizens and administration. 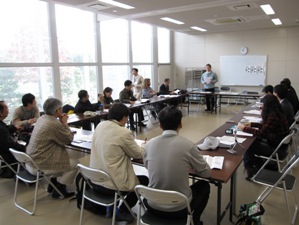 They also had a lively exchange of views mainly on topics like river restoration technology and consensus building.